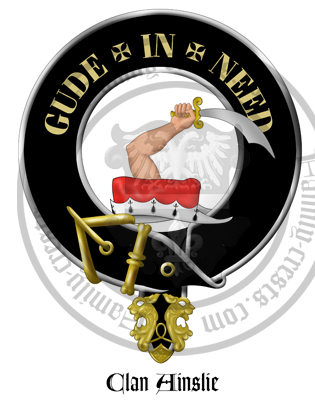 Clan Badge: On a chapeau a naked arm embowed grasping a scimitar proper. Arms: Or, a cross flory gules. Crest: On a chapeau a naked arm embowed grasping a scimitar proper. Supporters: (Clan chief only) Two knights in chain armour armed at all points, the dexter having the beaver of his helmet up and leaning on a shield or, charged with a cross flory gules, the sinister capuched with a skull cap holding a spear with a flowing pennon azure, in which in a canton argent, is the above-mentioned crest.